Maybe now we can actually get a full day out of our phones. 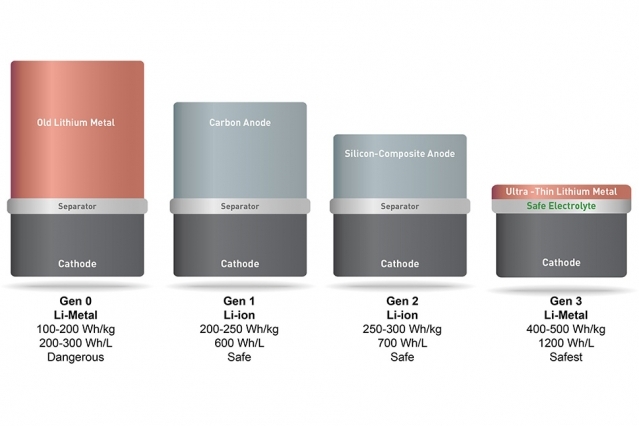 SolidEnergy Systems, a company founded by MIT alumnus Qichao Hu who also serves as the company’s CEO, has announced that will soon make a rechargeable lithium metal battery with double the current capacity of those available today commercially available. “With two-times the energy density, we can make a battery half the size, but that still lasts the same amount of time, as a lithium ion battery. Or we can make a battery the same size as a lithium ion battery, but now it will last twice as long,” says Hu, who also co-invented the novel battery at MIT. Their product is an “anode-free” lithium metal battery that is twice as energy-dense, making it perfect for most consumer electronics such as smartphones, wearables and even electrics cars or drones. Batteries today typically use the anode material graphite. To double the battery capacity, SolidEnergy swaps this with a thin, high-energy lithium-metal foil that can hold more ions.A few chemical modifications also allows their product to be safer and because it requires existing lithium ion manufacturing equipment to produce, the product is also scalable. A prototype was unveiled back in October 2015, which prompted interest and support from investors, amounting to over $12 million. The battery will be applied to drones first by November this year and could be available for smartphones and wearables by 2017. The company is also targeting use for electric cars by 2018.